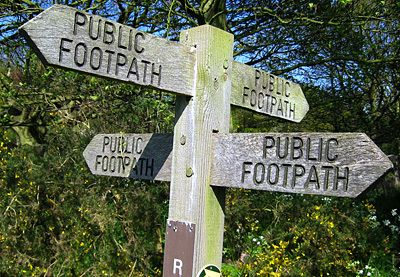 Few things can split a rural community more sharply than footpaths and rights of way over land. Ardent fans of The Archers will know how heated the Lynda Snells of this world can become when a public footpath is threatened by a landowner. Recently in the radio show, Adam Macy courted controversy when he planned on diverting a footpath at Home Farm so he could expand his polytunnel business. A compromise was reached when his father gave the village some land in exchange for the right to reroute the path. Kevin Allen from John D. Wood in Lymington isn’t as optimistic, stating he’d advise buyers to steer clear of a property with a right of way going through it. ‘It won’t be easy to move and there’s always someone who’s walked his dog there for 40 years adamant everything should remain as it is.’ Another difficulty, according to Mr Allen, is the propensity for vendors to insist having a right of way over their land has never presented a problem. He never believes what the seller says, and advises interested buyers to turn up armed with a flask to check out the path at different times of the day, counting the number of walkers and vehicles. Any prospective purchaser should start by determining what sort of right is in place. An easement is the right to use another person’s land for a stated purpose, such as being allowed to cross over to access a forest. It might also give a utility company the right to erect power lines or bury a gas pipeline. Usually, easements are included in a deed and remain in place if the land is sold. Another right of way where buyers must be vigilant is an informal agreement between neighbours. ‘A former occupant might have allowed someone to cross through your orchard, using it as a shortcut to the church. This friendly arrangement might not be in writing, so you need to talk to locals to discover the practice. It will only cost a couple of hundred pounds to pay a lawyer to lodge a new deed with the Land Registry terminating the custom,’ she says. Although disused railway lines backing on to a property might provide wonderful spaces to walk the dog, ride horses or allow children to ride their bikes, there can be security issues, adds Mrs Bowman.